fadelstein – EHFC Members Talking! 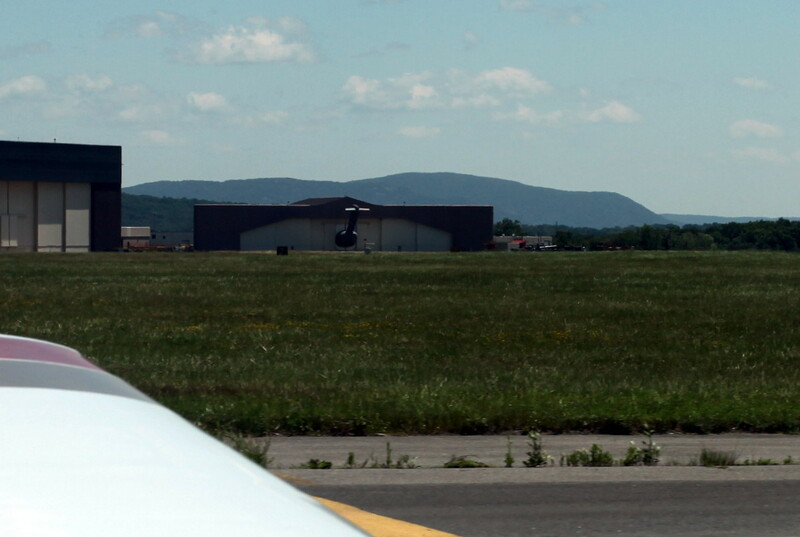 I took a day trip in the Mooney to the Newburgh/Stewart airport a week ago. Flew out around noon with two friends. Skimmed the tops of a scattered/broken layer on the trip out. Spent the day at Storm King Arts Center looking at all sorts of art. Had dinner in Newburgh and then flew back at night under clear skies and smooth air so the plane was ready to go for breakfast flights 8 hours later. A very nice day trip, and a nice destination. A few months back, I saw a documentary at Cornell about Andy Goldsworthy, a Scottish artist who uses natural materials in his work. There are two of his works locally, one at The Plantations and one at Sapsucker Woods. The movie covered him creating a work at Storm King Arts Center, which is near Newburgh, NY, by the Hudson River. It’s a 3 hour drive from Ithaca, or better yet, about an hour by air. After seeing the movie, I invited two friends to join me on a photo-adventure. This covers the flight there and back; pictures from Storm King are here. 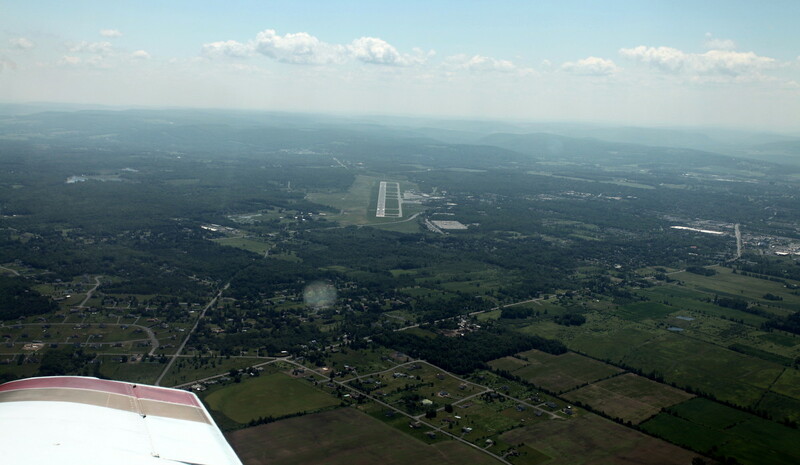 The Stewart/Newburgh airport (KSWF) is about 7 miles from Storm King. The airport was a former Air Force base, and has an enormous runway (over 12,000 feet long), and the Richmor Aviation FBO has a good reputation. It was likely to be a VFR flight, since truly low IFR weather would likely mean that the weather was bad everywhere, and we probably wouldn’t want to spend the day outside. However, I wanted to be current and proficient, which meant I needed to get some approaches in with a CFI. 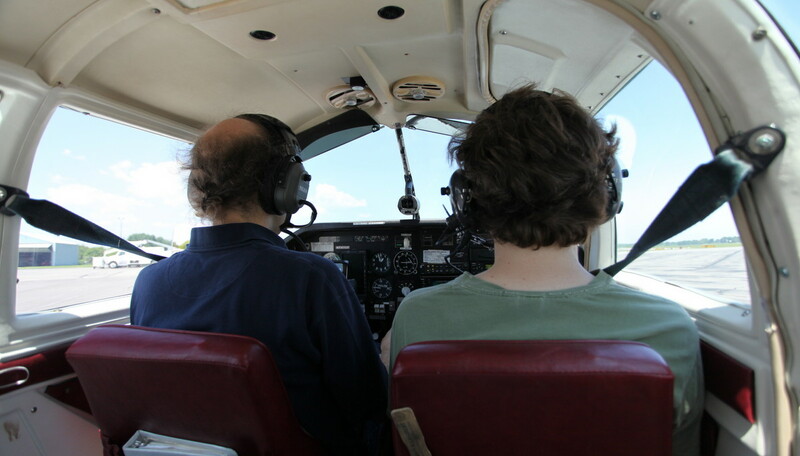 I could have flown the approaches with a safety pilot, but I wanted feedback from an instructor. Also, even though the days are long, if we had dinner and wanted a leisurely flight home (or had to wait for some weather to pass), it might be dark, which means I needed to be night current. It took a number of attempts to get the weather, plane, and CFI and my schedules to all align, but I made these plans a few months in advance. The only downside was a night checkout winds up being late-ish. With that all taken care of, it was on to planning the actual flight. It looked like the weather was going to be favorable. I figured I’d fly IFR anyway, just for practice if nothing else. I checked out previous routes used to Stewart on FltPlan.com. It was helpful, but of course it was not the route ATC provided in their clearance, nor was it the route I wound up flying. But that’s normal for IFR. When I plan a VFR route, I’m much more careful about waypoints and timing, since that’s the route I will actually fly (baring diversions, weather, TFRs, etc.). With IFR, that is practically never the case, there are always minor changes. I plan the route, do the fuel planning, and for the Mooney I’ll plan when I need to switch the fuel tank (right and left don’t feed at the same time), but I don’t get too hung up on all the minute details. I had discussed my plans with my friends. Plan A and its variations (might have to leave early, later, etc.). Plan B was if the weather was bad only in Ithaca or the plane was unavailable, we might drive instead. Plan C was if the weather was bad everywhere, we’d get dinner in Ithaca and watch a movie. There was the extra complication that the following day was the flying club’s breakfast, and I really wanted to make sure the plane was back. I also wanted to be aware that I really wanted to get home. About all I can do is know that there is that pressure. It’s nice to know where one stands with one’s passengers. My friends arrive. We get in, start up, taxi to the north ramp and I pick up the clearance. A slightly different route, but not too different than what I had filed, just a dog-leg at the end. I enter the route into Foreflight in the iPad and the Garmin 430 GPS and we taxi to 32. We’re cleared for takeoff and we’re off. After a minute, Ithaca hands us off to Elmira, and once they radar-identify us, we get a right turn on course (the first minute was spent going the wrong direction, but again, standard IFR). We get cleared to 7000 feet and climb to that. There’s a scattered layer of clouds at around 5500 feet. I was hoping we’d top the clouds but that wasn’t going to happen at 7000, and looking at some of them, even 9000 would not have kept us clear. So we stayed at 7000, in and out of the tops and I got to log some time in “actual” (clouds). There were a few bumps, but no way to avoid them. Elmira switched us to Binghamton. About 10 miles out from the Hancock (HNK) VOR, I asked ATC if we could go HNK direct to KSWF. The controller said she’d check, and a minute later we were cleared direct. No dog-leg, and with a few knob turns on the 430, a press of the “direct” button, and some “enter”s, we were heading direct to Stewart (there were also a few touches and taps and slides on the iPad as well). Binghamton handed us off to Boston Center, who kept us for less than one minute before handing us off to New York Center. At 7000 feet, I was able to pick up Stewart’s ATIS from around 50 miles out. ATC had us start our descent a comfortable distance out from SWF. I spotted the Orange County airport, which is 7 miles west of Stewart, and then saw Stewart. It’s pretty hard to miss Runway 9/27. We entered a right base for 27 and landed. The runway has a displaced threshold. It actually used to be a bigger runway. I’ve landed there once before, and both times it feels weird flying over what feels like perfectly good runway before reaching the threshold. Of course, there’s still two miles of runway ahead. We landed and were able to exit at the first taxiway after the threshold (A4). The Air National Guard is still active, and my friends found it amusing to see the tail of a plane sticking out of a maintenance hangar. I speculated that it was a teleportation experiment that went south. We arrived at Richmor and the car I had rented was there waiting for us. We then headed off to Storm King. Go here for our Storm King adventures and many photos. Late in the day, I did a quick check of weather, borrowing a friend’s smart phone. The forecasts showed generally clear skies and smooth air. We left Storm King around 7:30 pm, drove to Newburgh, had a very nice sushi dinner on the Hudson, and then headed back to the airport. My plan was to get to the airport around 9:30 pm or so, departing around 10pm. Earlier in the day, the FBO attendant said that they staff the FBO till 10pm or so, but that the tower is open all night. Everything went smoothly at the FBO. I called Flight Service, filed my flight plan, got a standard weather briefing, and then was ready to go. This time, I decided to get my clearance using my handheld radio before packing everyone into the plane. I had heard of the intersection, and knew it was not spelled in a normal way. Turns out it was “WEARD” and it wasn’t really out of the way. They had also given us the “Stewart 5 Departure Procedure” which I looked up. It basically amounted to “climb to 3000 feet, heading 272, expect radar vectors to the cleared route and altitude” and also specified the departure frequency. It was pretty minimal, but I guess if it’s a busy time, it saves a few words the controllers would need to say on the radio. 10pm is definitely not a busy time. We started up and taxied out. It is really helpful having Foreflight show the plane in relation to a taxi diagram using GPS information, especially at night at an unfamiliar airport, since there were places at SWF to avoid, such as the one on the taxi diagram labeled: “ANG Restricted Area”. It wasn’t too hard to navigate on the taxiways, but having something confirm my position was nice. We were cleared to cross Runway 16/34 (marked by the yellow flashy lights in the picture), and then ground called and said they had amended departure instructions and to let them know when I was ready to copy the new instructions. Since I was close to the first taxiway, I requested a Runway 27, intersection A5 departure, which was approved. Stopping in front of the Runway 27 hold short line on taxiway A5 (another set of flashy lights), I received the amended departure instructions, which were “climb runway heading, climb and maintain 5000 feet, expect 6000 10-minutes after.” Pretty simple and it replaced all the departure procedure instructions. The only point of it now was that they didn’t have to tell me the departure frequency. We were then cleared for takeoff. Even though I was not at the end of the runway, I was still behind the displaced threshold. It’s that long of a displaced threshold. It’s weird starting a takeoff roll before the start of the runway and then still having almost two miles of runway left by the time we rotated. The normal Mooney climb-out procedure is to retract the landing gear once there is no more usable runway and the plane has established a positive rate of climb. At Ithaca, this is typically 10 seconds or less after breaking ground. It didn’t take long to start the climb-out at Stewart. I put my hand on the gear control, verified a positive rate of climb on the vertical speed indicator (VSI), took a quick look to verify there was no more runway under us and … noticed about a mile of runway ahead of us. I kept my hand on the gear control and waited. And waited. And waited. Once we were at pattern altitude, I decided there’d be sufficient time to lower the gear if needed and raised the gear. The tower then told us to “contact New York Departure on 132.75.” It was nice for them to be explicit, though now everything in the departure procedure was either redundant or invalid. On the other hand, it was good practice to get one. I called departure, told them my altitude and that I was climbing to 5000. Shortly after that, they told us to climb and maintain 6000. Before switching us to New York Center, they advised us to expect our final altitude to be 8000 (instead of 6000). Center then had us climb to 7000, followed by 8000. This was all one constant climb, with each new altitude provided before we leveled off and all I needed to do was bump up the target altitude setting (“bug”) on the Aspen with the twirl of a knob. In cruise, the air was completely smooth with no clouds below 12,000. One of my passengers, who has a sensitive stomach, was happily reviewing photos from the day, completely comfortable in the back, pleased with the decision not to skip dinner, while the other was enjoying the view from the front. There’s not a lot to see between the Hudson and Binghamton, but we could see city lights to the north and south (Wilkes-Barre and Syracuse). Just before Binghamton, ATC started us on a descent down from 8000 feet. 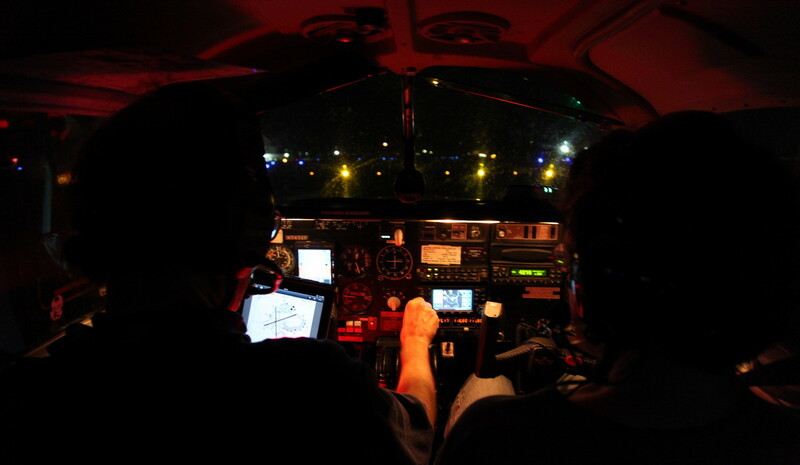 At 6000, almost abeam the Binghamton airport, I keyed the mic on the Ithaca common traffic advisory frequency (CTAF) and out of the darkness the approach lights sprang to life. (Note: That is one of my favorite parts of flying. It’s just so cool seeing the lights appear out of the darkness.) We continued our descent and were handed off to Elmira. At 10-15 miles out, I cancelled IFR and switched the radio to the CTAF. I realized I could see the approach lights, the RAILs, and the threshold markers, but I didn’t see any runway edge lights. I cycled the lights down from high to medium intensity. The approach lights changed, but still no edge lights. I had the VASI in sight and as we got close I saw the runway markings light by our landing light. Rather than get distracted trying to diagnose something on final approach, I decided flying and landing was the top priority. It was uneventful. I saw the lead-in line on the runway and the unlit taxiway marker. I didn’t try to play with the lights anymore and just taxied in. 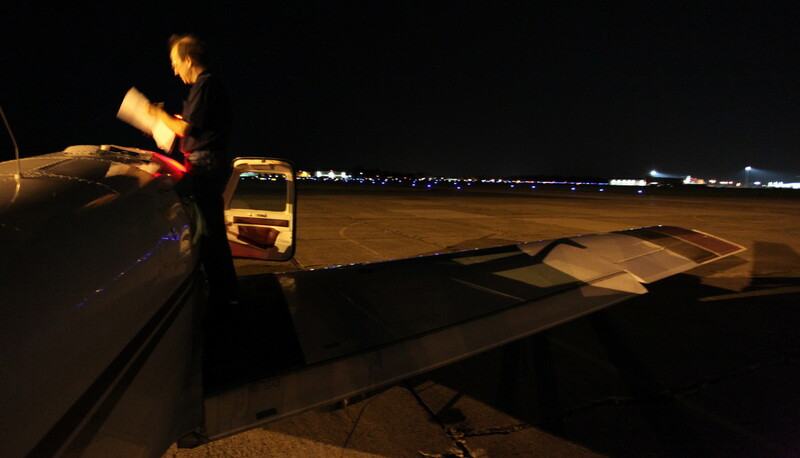 We fueled the plane, tied it down, checked it in and headed home. It was a nice day trip. I like when things work.